The Willett, Hofmann & Associates, Inc. Transportation Engineering Department provides engineering services for design, construction, and maintenance of streets and alleys, rural and major highways, recreational paths, traffic signals, and street lighting, as well as intersection design studies, storm sewer analysis, and storm water management facilities for projects of various sizes and complexities. The WHA Transportation Engineering Department has a knowledgeable and experienced staff of engineers, technicians and construction inspectors. Our experience includes planning, preparing and executing maintenance programs for municipal and governmental clients to preserve their existing streets and highways. We also have a vast project history designing major reconstruction and new construction projects. We understand federal, state, and local design standards and permitting requirements and are experienced in working with various forms of project funding including Motor Fuel Tax Projects and Federal Aid Projects. A key component to the competence of our staff is the cross over training in both design and construction. All staff members spend a portion of their time each year performing construction inspection, observation, and documentation as well as project design. Being well versed in construction operations and policies helps make for better, constructible designs. Our design experience also allows the staff to be proactive in heading off construction issues and have prompt, well thought out issue resolution. Continuing education advances our design and construction experiences. Keeping up with current and developing technologies allows for seamless coordination with jurisdictional agencies and better service of our clients. Our staff continually assesses the various available software programs and building materials, along with design and construction technologies to provide efficient project development and completion. 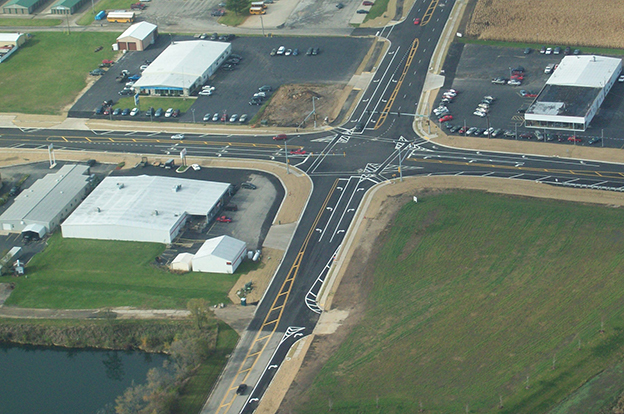 Willett, Hofmann & Associates, Inc. is qualified for transportation projects of any complexity.